This bright cartoonish casual game actually tackles with one of the global problems of our world today. You get to stand for the the organic food with all natural ingredients. 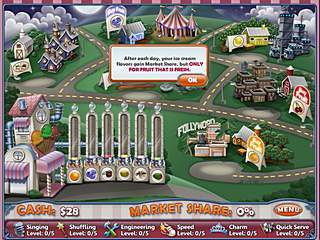 You only get to do this in the ice cream market in Ice Cream Craze: Natural Hero, but who knows where the next sequel will go. Maybe in the world of these series all of the food will be reall again, like it used to. Anna wants to kick him out by making her market share bigger and bigger. Ice Cream Craze: Natural Hero is the third game in the Ice Cream Craze series, and this time Anna is back to fight against Dr. Bane. Evil Dr. Bane has conquered the market of desserts in your town with his totally chemicals-based produce. Anna wants to kick him out by making her market share bigger and bigger. This is achievable by making and selling her all-natural desserts. 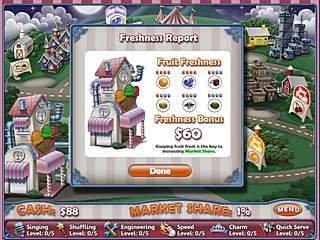 You activity in this game will, basicly, include serving customers, buying new ingredients, and upgrading your skills. The whole town is available for achieving your goal. The game is not liniar in the way you proceed. Getting new ingredients is crucial for you. Every location has 7 of them hidden. So your task is to find them in order to reach the best results possible. New ingredients increase your market share and steal the customers from Dr. Bane. The customers are different in every location. You will have to consider the differentces to work fast and still get good tips. Strategy becomes important as you progress, because you have to pay for everything. So you need to decide what is the best investment. When you want to upgrade your skills or equipment you are taught by a character in each location how you can actually do it. Plus you will also have to complete a mini-game for that. 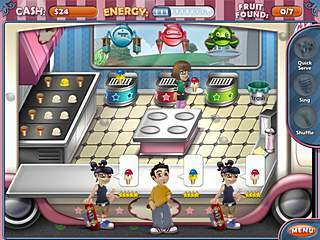 The mini-games are also about serving the food to the customers, but with some certain additional conditions. The egame is good and different in some aspects from the rest, but not without the flaws. The game is cute and fun! This is Ice Cream Craze: Natural Hero review. Download this game here.